So on Sunday I’m heading over to Belgium on work for a few days, my train gets in at around mid-day and I have the rest of the day to myself before I begin work on Monday so of course the first thing I did was look up the football fixtures. 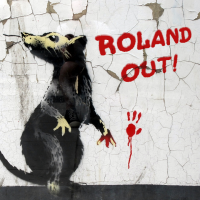 Turns out not only are our old stablemates and Yohann Thuram employers Standard Liege at home, they’re playing current network brothers St Truinden (who I notice have also begun a campaign against RD) so I bought my ticket quicker than you could say “do you reckon Roland will be there”. I think a few of you may have been to Liege before for pre-season games and as I have a few hours to kill before the match I was wondering if there were any decent pubs in the vicinity of the ground ? Anywhere that does decent beer and shows football would be good, I see that the Ultras have their own bar at the stadium but I'm not sure if that would be too mental. Anything else worth doing in Liege ? Who should I support ? Unfortunately I think my chances of seeing Thuram play one more time are limited, Standard signed Victor Valdes last week who I would imagine is still a marginally better goalkeeper than old Yohann. There are lots of street vendors which sell beer, the main bar I saw was on the NW corner of the stadium, it'll be the one with the street music. They show football inside. Don't worry about ultras, you're not seeing Napoli. You can get bus number 2 from the station then we walked back. It is a run down, grotty industrial area though. We didn't have time to see the town centre (opposite direction to the stadium) but it's presumably nicer. You'll be able to buy match tickets out the back of the north stand (the river being the south side). I see that the Ultras have their own bar at the stadium but I'm not sure if that would be too mental. 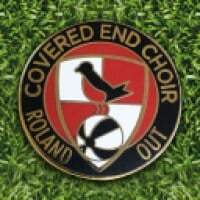 If you go in The Ultras Bar, with your Roland OUT stickers and beer mats, you won't have to buy another beer all day. Anywhere that does decent beer? Cheers - I've bought a ticket upfront (I could never handle the stress of going all the way there without having one!) so will head down and look for the bar on the NW corner, I think that might be the bar that's run by the Ultras. 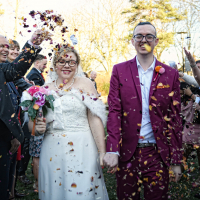 Not sure you can take these things for granted, even in Belgium. Not a cat's chance in hell Dushatalot will be there. He'll be even less thrilled to see a boy from South London if he does make the journey then ! How was the game se9addick? It kicked off at 5 our time. But do they have Addicks Ale? Really good game for a neutral, finished 2-1 to St Truinden (boo). 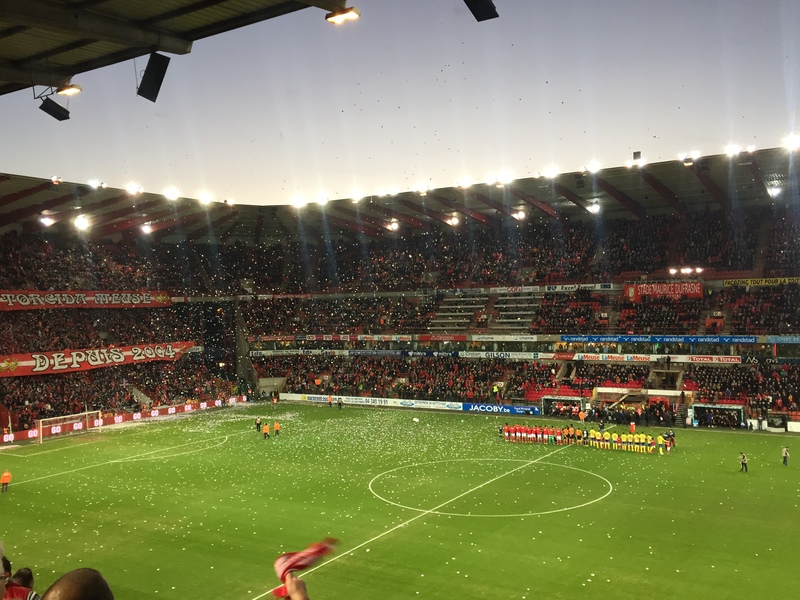 Liege is a bit like Woolwich pre-gentrification but around the stadium is really cool, lots of bars on the road opposite the ground, all with little windows that they serve beer out of so you can walk around the stadium having a drink. Found the Ultras bar, was a bit cringeworthy, but everything else was great. Atmosphere inside the ground really lively, bit of a trek from London but if you're going to be in Belgium anyway it's well worth a visit. To be fair I should have said pre-gentrification and pre-Marshall Plan ! @se9addick you didn't mention this! 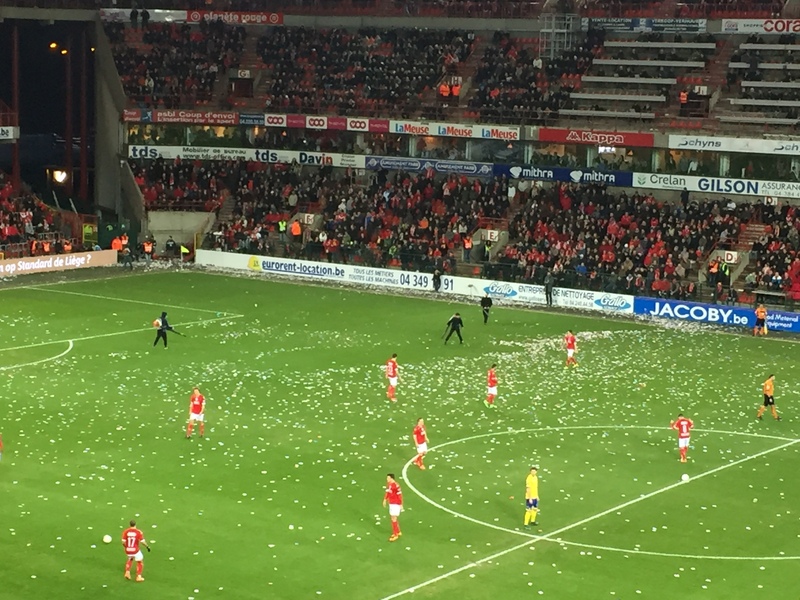 Game was delayed for five minutes as a couple of blokes with leaf blowers tried (and failed) to get the confetti off the pitch ! Yeah some guy was trying to explain this to me, but I didn't quite get it. So they split their league into three and the top section competes for the title/European places and the bottom to avoid relegation. What do the middle tier have to make it competitive ? Dunno, but it will mean a STVV v Liege (and return) this season, which might be interesting or a variety of reasons. I think STVV have now done the double over them this season.